What is the CFH12K camera? 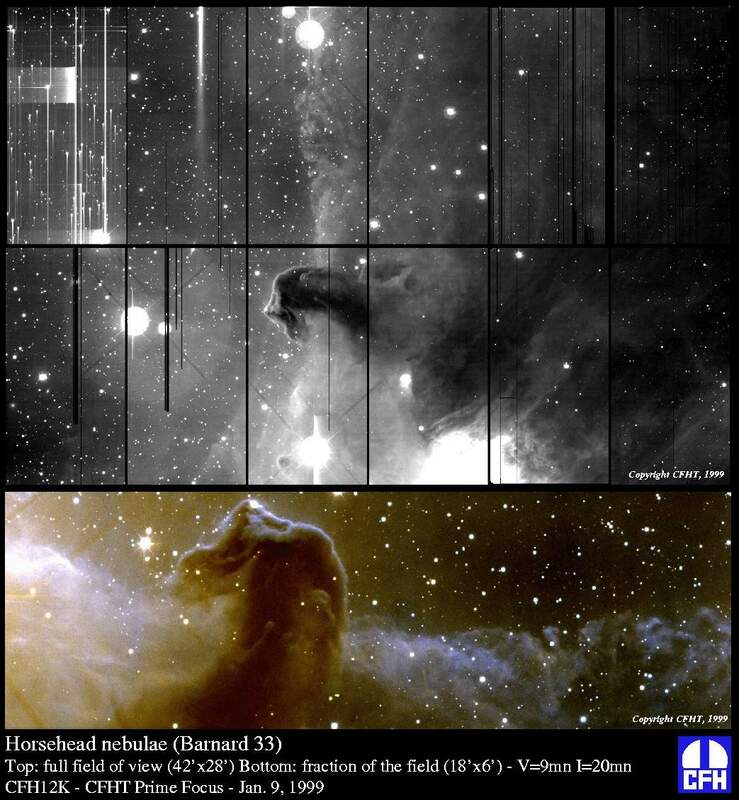 The CFH12K camera, for use at the CFHT prime focus, is the largest close-packed CCD mosaic camera in use today (2000) and saw first light on the telescope in January 1999. Not only does this camera cover a large fraction of the sky with each exposure (42 by 28 arcminutes, or more than 1.5 times the size of the full moon!) 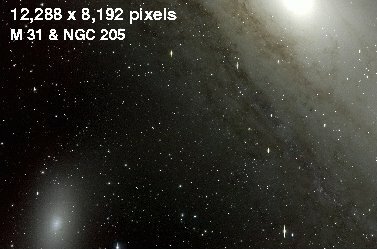 but its large number of pixels (12,288 by 8,192: more than 100,000,000 pixels or 200 Megabytes of data per image) provides a high angular sampling. 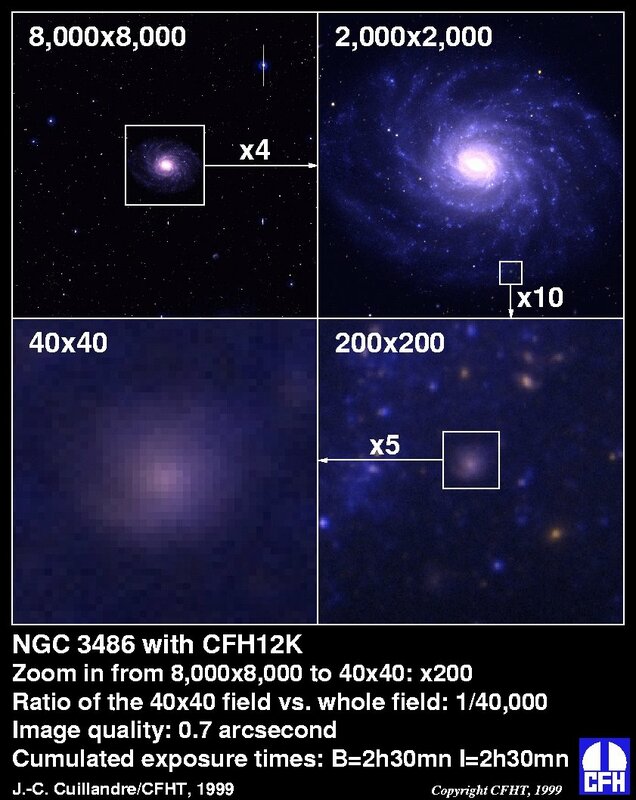 With a 15 micron pixel size, the scale at the prime focus (f/4) is 0.206 arc seconds per pixel, perfectly adapted to properly sample the superb image quality of Mauna Kea (median seeing at CFHT prime focus is 0.7 arcseconds). 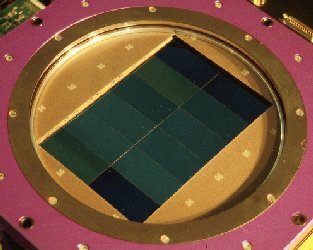 The camera is equipped with twelve 2048x4096 pixel CCDs from the MIT Lincoln Laboratories. These back-side illuminated CCDs provide significant increase in sensitivity, in particular in the B band. 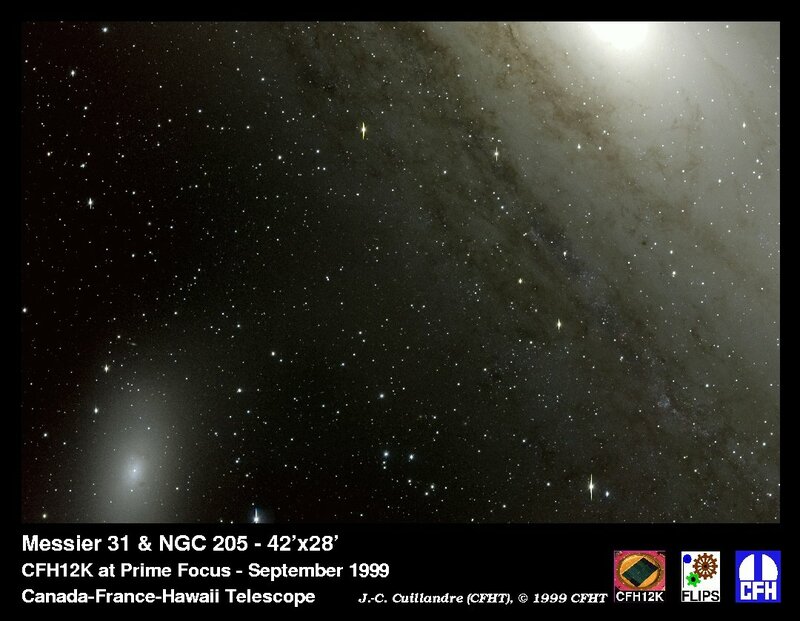 The camera was primarily designed and built by G. Luppino from the Institute for Astronomy (University of Hawaii) with substantial assistance of CFHT staff. CFHT was heavily involved in other areas of the project: data acquisition system, data archiving, CCD controllers, auxiliary electronics (for controlling the shutter, filter wheel, vacuum gauge, temperature,...), as well as, camera characterization and improvements of the CFHT prime focus to ensure the best optical conditions and reduction of scattered lights. CFH12K is a CFHT instrument fully suported for the entire CFH community. CFHT is now working on a data reduction and data evaluation pipeline (``Elixir'') that will produce optimal calibrations and information to ensure the highest scientific return from the data. Tables and interface for SNR, limiting magnitude and exposure time evaluations. Bright stars: prepare your pointings to dodge nasty bright stars! A tool developed by John Thorstensen (Dartmouth College) that precesses coordinates, provides sun & moon rise & set times, moon phase, LMST, Galactic coordinates, parallactic angle, an hourmass table, Julian date, moon phase. New camera performance after swapping output on CCD03 (from left to right).